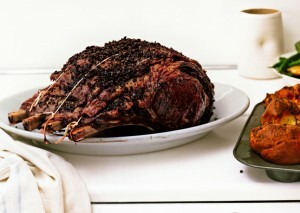 Standing rib roast is an amazing “splurge” meal. Its so delicious and worth the expense on special occasions. Pulse all ingredients in a food processor until a coarse purée forms. Line a rimmed baking sheet with plastic wrap, leaving a long overhang on both ends. Place roast on top. Season meat with salt and pepper, then rub tapenade all over roast. Preheat oven to 425°. Unwrap roast; set on a rack inside a deep roasting pan. Pour 2 cups water into bottom of pan. Roast meat until deep brown, about 40 minutes. Reduce heat to 325° and continue to roast until an instant-read thermometer inserted into the thickest part of meat registers 120° for medium-rare (temperature will climb to 125° after removed from oven), about 1 1/2 hours longer. Transfer rack with roast to a cutting board; let rest for at least 30 minutes. Stir 1 tablespoon margarine and potato starch in a small bowl until well blended. Whisk half of margarine mixture into pan sauce. Return to a simmer and season to taste with salt and pepper. Sauce should be thick enough to coat a spoon but still runny. Whisk in remaining margarine mixture to thicken more, if desired. Carve roast. Serve sauce alongside. not sure if you know but there is flour in this recipe? Thanks so much! Should be potato starch and is used to thicken the gravy so that can be omitted too. It’s corrected, thanks for good editing eyes!